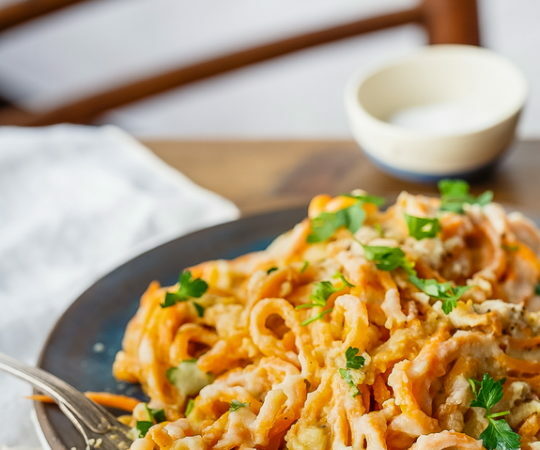 Bring a new taste to pasta night with roasted red pepper pesto. 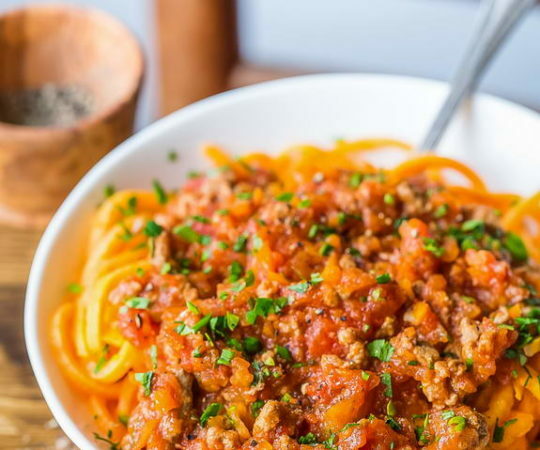 A delicious, smoky-flavored alternative to tomato sauce, red pepper pesto is easy to make and goes great with zucchini noodles or spaghetti squash. Roasting the peppers gives the dish a depth of flavor that cannot be beat. To make the pesto, red peppers are first blackened under the broiler. Don’t be afraid to let the skins get completely black, because then they will be easier to peel off. Once the peppers come out of the oven they are steamed for ten minutes to loosen the skin, and then it should peel right off. While the peppers are steaming, you can start sautéing a bit of onion and garlic in a saucepan. Once they are ready, add the peeled peppers and a drizzle of olive oil, then remove from heat. At this point you can transfer everything to a food processor, or just use an immersion blender right in the saucepan. Puree the ingredients and adjust salt and pepper to taste. If you would like the pesto to be smoother, simply add more olive oil. That’s all there is to it. 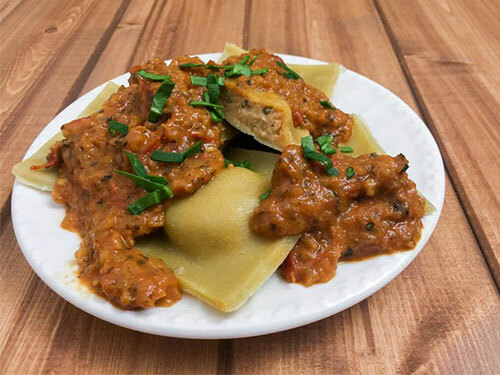 Without any actual grains and pasta on the Paleo diet, it’s a bit crazy that you can even have a regular weekly pasta night. 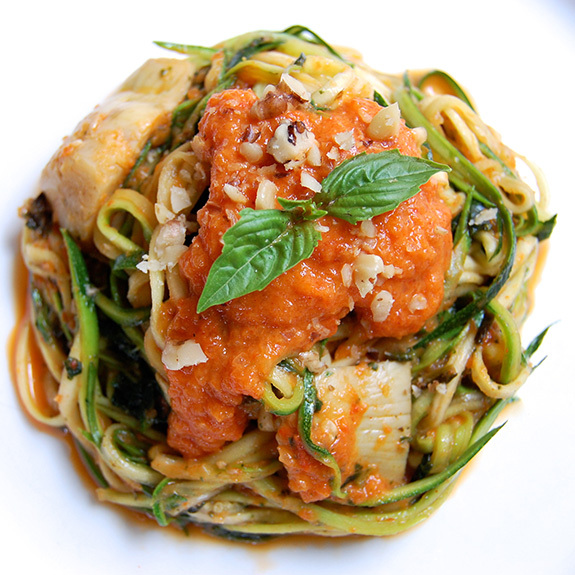 But there are so many different options emerging thanks to spaghetti squash, zucchini noodles, and even carrots. 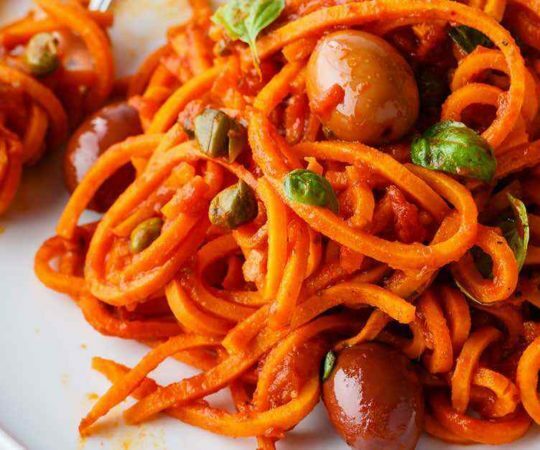 Vegetable spiralizers make the ‘noodles’ look better than ever. 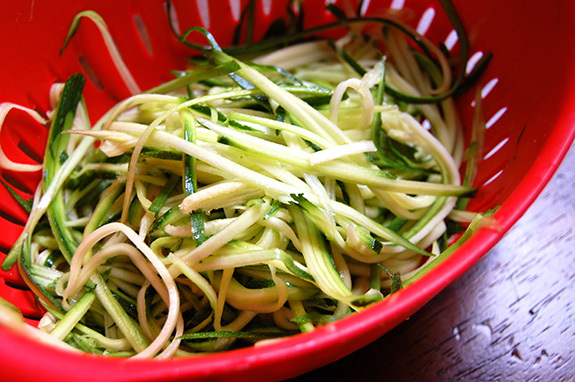 If you eat vegetable noodles a lot, I would highly recommend getting a spiralizer. It can turn many things into curly, spiral-shaped strands (also good for topping salads). 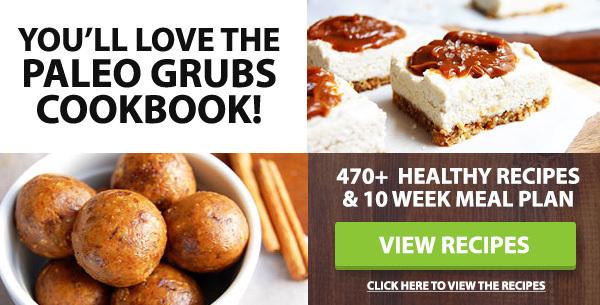 It’s an easy, creative way to add more vegetables into your meal plan. 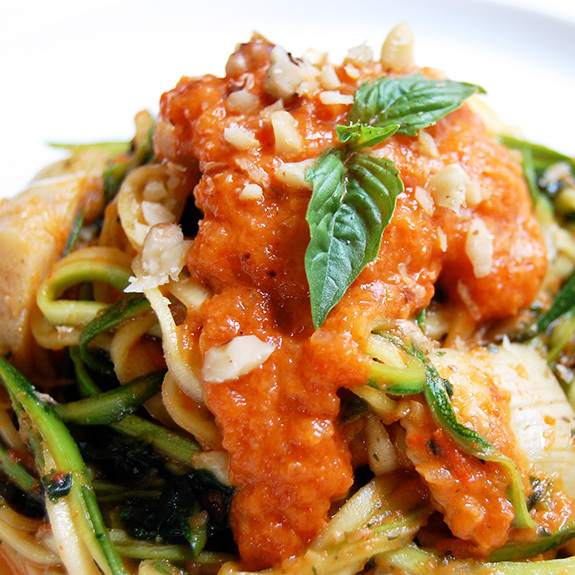 In this recipe I use zucchini noodles but think that spaghetti squash would also go very well with the pesto. 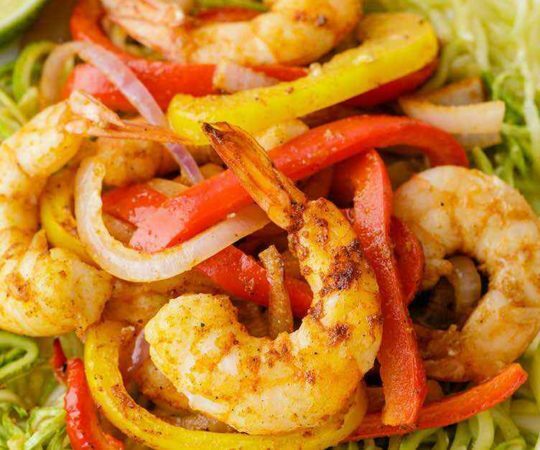 Zucchini noodles are probably one of the easiest Paleo “pastas” since little cooking is required, if you decide to cook the noodles at all. To accompany the zucchini noodles I added artichoke hearts and spinach. Fresh or frozen spinach would work, depending on what you have available. All in all mostly simple ingredients, to let the flavorful pesto really shine. Preheat the oven to broil and move the oven rack to the top position. Line a baking sheet with aluminum foil. Cut the bell peppers into quarters and remove the seeds. Place flat on the baking sheet with the skin side up. Broil for 12-15 minutes until the skins are blackened. 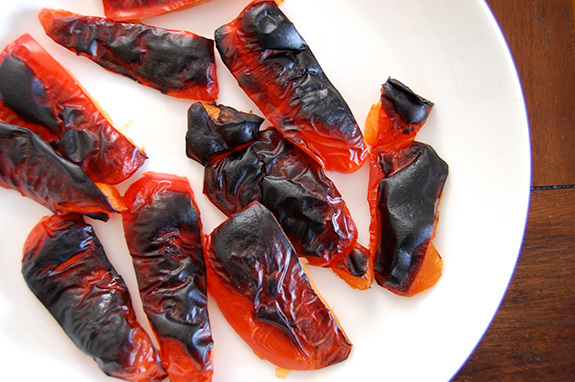 Place the blackened peppers into a paper bag or Ziploc and close. Allow the peppers to steam for 10-15 minutes to loosen the skin. Meanwhile, heat one tablespoon of olive oil in a saucepan over medium heat. Add the onions and garlic and sauté for 8-10 minutes. Stir in the paprika. Turn the heat to low to keep warm. Remove the bell peppers from the paper bag and gently peel off the skin. Place into the saucepan with the onions and add three to four tablespoons of olive oil. Remove from heat. Use an immersion blender to puree, or transfer to a blender. Blend until smooth, adding more olive oil if necessary. Add salt and pepper to taste. In a separate pan, heat the remaining tablespoon of olive oil. Add the spinach and artichoke hearts to the pan and cook until the artichoke hearts are slightly browned. 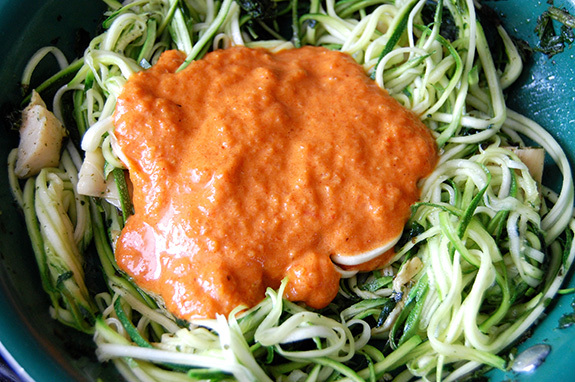 Stir in the zucchini, and then add your desired amount of the red pepper pesto. Toss to coat. 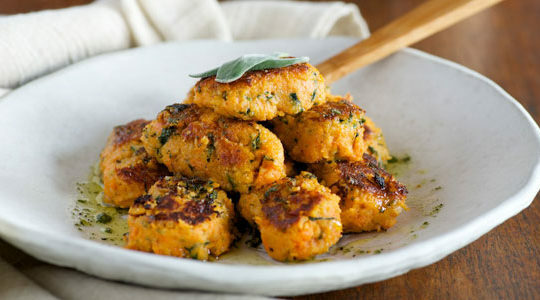 Serve warm, garnished with walnuts and parsley.